Unbeliveable pub, went in there with me old mate barry hatrick to pull a few binting milfs, but Jeremy the landlord caught barry giving a big dolly bird a dirty fish hook round the back of the bins, and I was asked to leave as I cheered at spurs winning on the tv, nice pub if you like getting a reach around. In an area (Sheen/Mortlake) where there are no remarkable pubs - just snooty or plain ones, this pub remains a magnet for those seeking sport. It's diffcult to describe this pub diplomatically, but it's safe to say people who go to The Victoria wouldn't come here. I'm neither, as I prefer pubs elsewhere to Sheen. If I were to recommend any pub in Sheen/Mortlake, however, I'd probably go for The Plough (the best of a disappointing bunch). 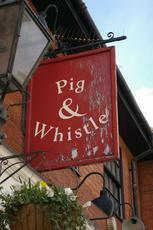 The Pig & Whistle would be 'the one to avoid'. It looks slightly better than the dire pub it was , but it's still not a pub I'd recommend to anyone. If you're a student, you like bland mainstream lager while watching sky sports (mostly football) with expletives thrown in then you won't mind the place; but if you're after something more (cosy? relaxed? refined?) then forget it - head into Richmond instead. One more thing, it says 'est. 1924' on the sign outside - this is incorrect. It's only been in existence since 1987 - before this there was a larger, grander pub known as The Bull. A novel marketing opportunity for The Pig & Whistle. A pub for swearing in Sheen. 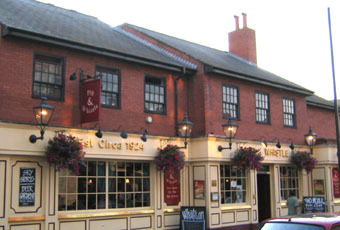 The Ship is 10 minutes walk away by the river via Sheen Lane. The have Sky and there is no swearing. Agree with previous comment, only worth a visit these days to watch the footy as it�s the only pub in the area that has Sky. The clientele in here have gone back to how they were previously, a bit rough and ready! Personally i don�t care what you look or sound like but i do object to the foul language. I popped in briefly the other day for a quick pint to catch up on the Olympics and every other word coming from the group of lads underneath the TV was F**k this and F**k that. Shamefully the bar lady was too busy joining in and laughing. Will be giving this place a miss next time. Disappointing place. Only go there if you want somewhere to watch Sky Sports and have a swear rather than doing so in your front room. Had two drinks and both times given wrong change (Got charged �8 for one pint and the barmaid blamed the till - er...) Will go back but only to watch football with other fans rather than for the service or beer as there is no other pub that does so in the area.